Denise brings over twenty years of sales and marketing experience in the hospitality industry. 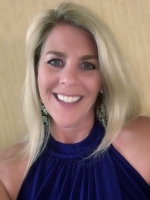 Having started on the ground floor as an Operations Manager for a DMC in Las Vegas, NV, she worked her way through many facets of the hospitality industry; creating a social media conference for women, Corporate Event and Trade Show Manager to most recently, Senior Sales Manager at a local DMC. As the Director of Sales and Marketing for By Design Collective, her favorite part of what she does is empowering her team to design award-winning events. She loves the ever-changing landscape of events, the creativity, the innovation and the WOW factor you can present to clients. The reward of seeing an event come to fruition that has exceeded the clients expectation, keeps her engaged and excited about her position. In her downtime, Denise loves exploring the Denver restaurant scene, spending time with her teenage son and spunky hound, Daisy.